Here it is. 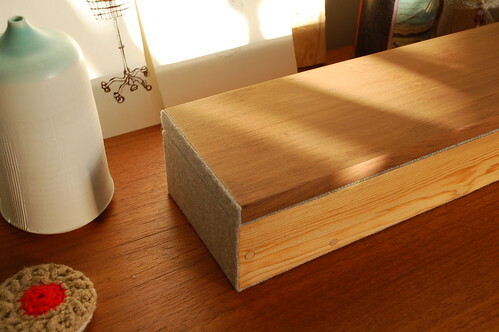 My handmade cedar jewellery box from Andrew. Designed to sit atop my teak dresser, the box is three feet long. 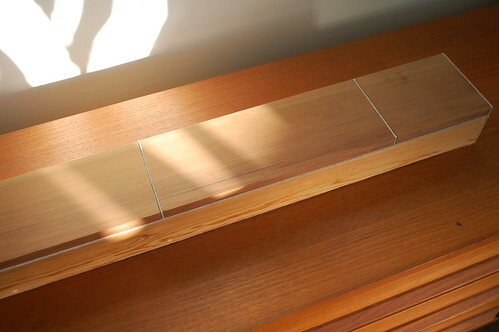 The lid is divided into three sections of varying lengths. The smallest section is meant for jewellery I wear often and is placed on the right since I am right handed. 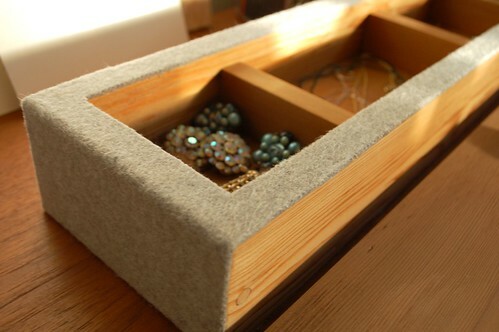 The lid is also designed to fit snug on top and has a felt lining down the side. 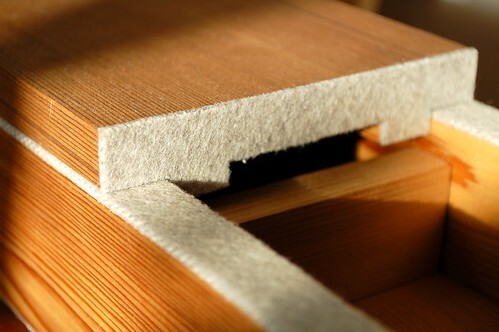 The top of the box beneath the lid is lined with a single piece of felt that runs up the sides and across the bottom. 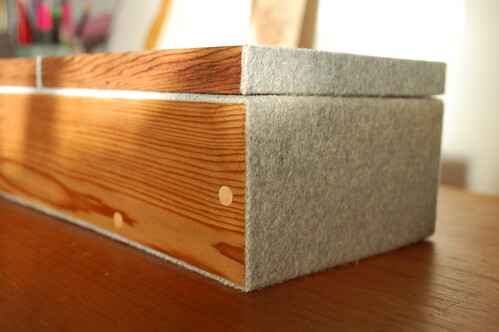 When the lid is put back in place, the cedar brushing on felt makes such a lovely soft sound. 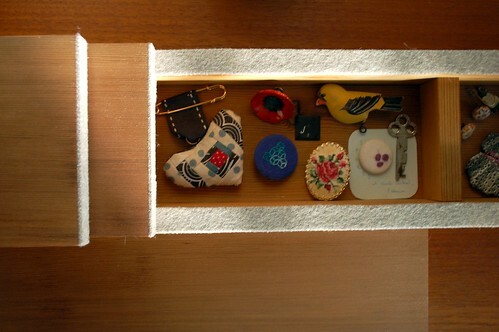 There are seven compartments inside that allow me to divide my treasures into little collections and categories. I can’t help but marvel at all the thoughtful details and care that went into making this gorgeous box. One of my favourite features is the delicious cedar smell everytime I peek inside. It looks so beautifully crafted. Gorgeous. wow this is so beautiful! 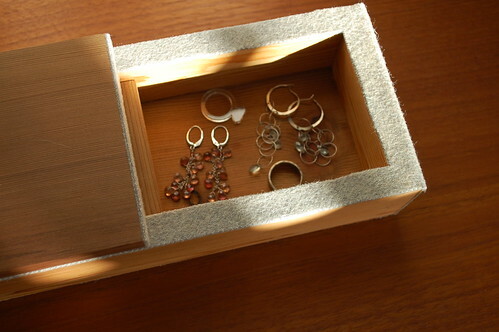 it’s a jewelry box AND a treasure chest! I have the same AMT acrylic ring too in black, clear and yellow! A++ It’s just lovely. Well done, Andrew! It is beautiful, functional, thoughtful and truly a piece of art! Stunning! Its beautiful….A real treasure in itself….amazing. i tried to imagine the soft sound of the felt on the cedar but couldn’t. it sounds really lovely though! i got way way too excited when i saw my little pin in your jewellery box, along with with jen and julie moon’s pins that i recognized! what a thoughtful present! I would have so much fun making little categories and collections. And with the smell of cedar – heavenly. karyn. i am in love with that amazing box. and with andrew’s skills. So completely beautiful. I’m so envious!